Chesterfield is an internationally recognised brand and their sofas and chairs are used across the world to add luxury and class to a wide range of settings. Chesterfield is the preferred choice for anyone looking for the highest standard chairs and sofas – and now you can enjoy the luxury and class they exude in your very own home. The Chesterfield Queen Anne Chair is Fit for Royalty! The Chesterfield Queen Anne chair is reminiscent of times past; with a high winged back and exposed legs it wouldn’t look out of place in a palace, and with Zest Interiors you can bring this classic style into your home for just £349.99 – saving you 50% on the standard RRP. With hand crafted intricate detailing and the finest quality leather, the Chesterfield Queen Anne chair is a Royal choice for any home! 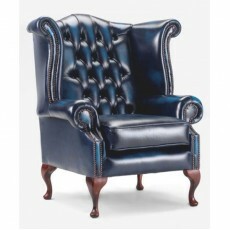 If you want something slightly more modern in style, the Chesterfield Club chair is the better option for you. With a deep seat that is surrounded by padded leather, the Chesterfield Club chair is the perfect comfortable seat and is ideal for the living or sitting room. With the recognisable buttoning and brass beading, this chair is unmistakably a Chesterfield and will look fantastic in any surroundings. At Zest Interiors we pride ourselves on providing the highest quality furniture at prices you wouldn’t expect. Our Chesterfield furniture is hand crafted by trusted Lancashire suppliers and is available in several colours – red, green, brown or blue – so you can make sure you new Chesterfield chair complements your home and decor. We offer nationwide delivery of all our furniture, and with many items already in stock you won’t have long to wait for your brand new Chesterfield chair or sofa. If you would like any more information please call our Sales Hotline on 0800 085 2822. 0 Comments To "Discover Chesterfield Chairs at Zest Interiors"